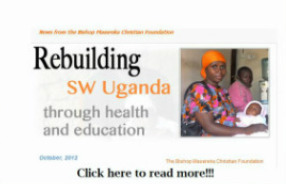 St. James continues to support the Bishop Masereka Christian Foundation (click on this link to learn more). The Vestry’s vision of supporting the BMCF has continued to expand through the generosity of the parish during 2011. Over the course of the year, the committee has sponsored several events to develop awareness, encourage sponsors and raise funds. Over $700 was raised during the Lenten “Building Bonds with Bricks” campaign. That equates to more than 1400 bricks and the mortar to seal them into the new hospital. In October, we were fortunate enough to tell our story at the diocesan convention. Then in November, the committee with lots of help put on a fundraising dinner affectionately dubbed a “Taste of Uganda”! That effort netted $993! These funds have been sent to Uganda to help pay for pharmaceutical supplies for the clinic as well as funding the sponsorship for Samantha Ainembazi who is an orphan of HIV / AIDS. The result is that children are attending schools who wouldn’t have without our help and people are being treated for HIV/AIDS and malaria and other diseases who would be suffering without our help!Additionally, over ten orphans continue to be sponsored for their education through St. James. Finally, the Diocese of Western NY.contributed a $1000 donation to the BMCF. 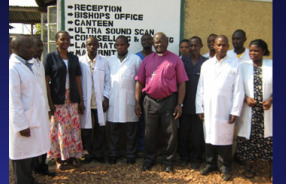 The committee is planning to host Bishop Masereka and Dr. Sambili in the spring of 2012. The Foundation supports about 560 students in 85 different schools across Uganda in East Africa and operates a medical clinic that treats over 5700 people annually. The Foundation is currently supported by parishes in 17 Episcopal dioceses around the USA, including the Diocese of Western NY. Support from these dioceses ranges from a few sponsors of students at $330/year to fundraisers resulting in tens of thousands of dollars per year.